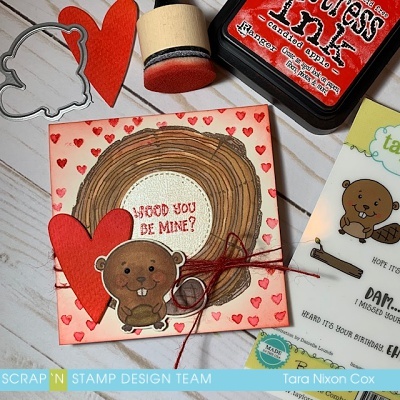 I was digging through my stamps the other day and I came across the "Busy Beaver" set by Taylored Expressions... and I was tickled to notice a sentiment I hadn't inked up before "WOOD you be mine?" Suddenly there was some Valentine's Day potential in a set that I hadn't used for a while! We featured this set in a SNS blog hop a while back (summer 2017 I believe) so if you've been following me there for a while you may already have this cutie in your stash! 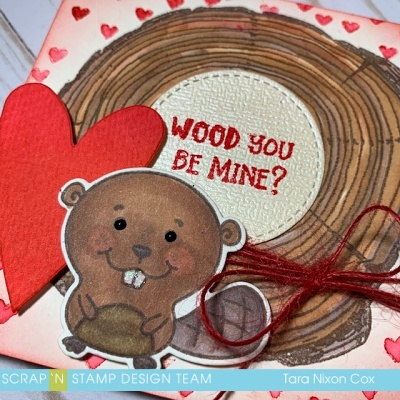 I paired this busy beaver with the tree ring stamp by Concord & 9th and added some hearts for a quick 4x4 Valentine! 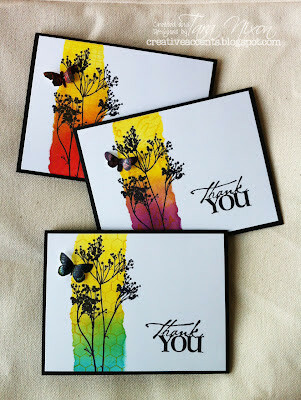 I used some ink blending and a sweet scattered hearts background stamp very similar to this one by MFT to add some color to my card background with Candied Apple Distress Ink. For the tree ring, I grabbed a handful of Copic Markers and followed the circular motion of the stamp to find a mix I liked. In doing this, I was also selecting which colors I would use for my beaver! It's a simple card, but would be a fun one to recreate in a set for Valentine's Day! Little details like my red twine bow, a heat embossed sentiment and some glossy enamel dots for his eyes and teeth really help to make this card special! I hope you like it!